I have used trend following stocks as a trading strategy for over 10 years and have made substantial and consistent profits during this time. Trend following stocks is a fantastic trading strategy because it is simple, doesn't require much time to execute and it has a long and consistent performance record. The return for effort is exceptionally high and it is possible to manage this sort of trading system while you still have a day job - or when you want to travel and spend a lot of your time focused on other passions like your family and friends! 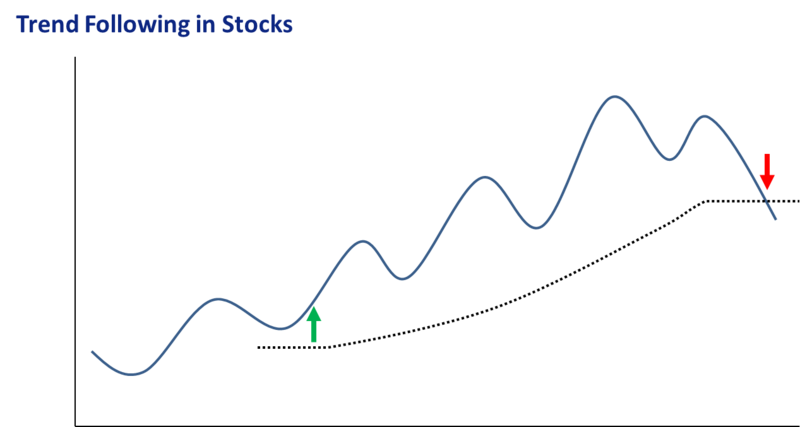 When teaching trend following, one of the interesting questions that comes up is "Why does trend following stocks actually work?" closely followed by "If this method makes money consistently, can be taught and isn't rocket science, why is there money still left on the table?" These are great questions and in the rest of this post I cover 8 important reasons why trend following stocks works, and should continue to work in the future. Trend following stocks is a simple trading strategy. A great trend following system does not have many rules, and these rules can be very simple. This means you don't have to be a rocket scientist to create your own trend following trading system. Given its simplicity and profitability you would think that everyone would be doing it and the profits would disappear. Trend following stocks is not emotionally easy...but it works! Most investors are not willing to remove themselves from their trading decisions and trust a trading system, particularly a long term system that loses on 70% of its trades (even if it does make bucket loads of money overall). Many factors play a part in this, but let's just say arrogance, insecurity, impatience and the need to be right all play a part. Impatience is one of the biggest reasons. So many people are just not willing to wait patiently and DO NOTHING while a trend moves their position in the right direction. Because of this impatience many people just can't follow a trend following system. I would say the second biggest reason is that our education system teaches us that you have to be RIGHT... At school you want to get 100% in a test, you FAIL if you get below 50% on a test. BUT trend following requires that you get into a lot of potential trends and quickly get out at a small loss if you are wrong. This means that trend followers have lots of small losses, and are wrong a lot. Most people (because of our education system) don't like to be wrong. When I tell people that I am wrong on 70-80% of my trades they look at me in horror - the look on their faces says "how could you be so stupid! You must be the dumbest trader on earth" but when I tell them that I make 10 times more on my winning trades than I lose on my losing trades they get confused and stop asking questions. Trading math is something that needs to be learned. Expected profit per trade is important, winning percentage of trades is not. But most people would emotionally be more comfortable with a high winning percentage even if they lost money overall - at least they can say they are right a lot and their small number of large losing trades are "just unlucky". They blame someone else like the market or their broker for those and just focus on their high winning percentage. They delude themselves that they will make money this way. Systematic trading, such as what you use when trend following stocks, removes the human emotion from all areas of your trading. It simply allows the systematic trader to identify when a price move is in place and capture it. Removing human emotion from market decisions really is the key to trading profits. We know trends do actually occur - a glance at pretty much any chart will show that. So when our trend following system finds one and gets into it then we profit from both the change in the fundamental conditions, the change in the investor sentiment and the change due to the influence of company management as discussed below. When a trend is reversed the trend following system gets you out (unemotionally) and you capture your profit. The emotional unsystematic investors and the buy and hold investors lose money because they hope prices will go back to previous highs... The trend follower is already out and has their profit! Mutual funds can't trend follow because they have to be fully invested. They also typically have a mandate (such as a certain sector) and they have to have a portfolio close to the relevant index else they have too much risk of underperforming the index and their peers if they get it wrong. Trend following systems have a massive advantage over mutual funds because they can exit stocks that are moving in the wrong direction and hold only stocks that are going in the right direction. Funds just can't do this. Also you never see a mutual fund go 100% to cash because they are not allowed to. But if you are a trend follower and there are no trends then you just hold cash! (Or if you are more advanced then you will have other trading strategies to focus on while there are no trends) So if you are a long only trend follower in stocks and there is a bear market then you will probably just end up holding cash while all the mutual fund managers lose money hand over fist as the bear market progresses. This means long only stock trend following equity curves can be much better than that of a mutual fund if you have a good trading system. Just look at this example of my own trend following equity curve overplayed against the ASX200 stock index. A buy and hold index fund investor would have gone nowhere and experienced very large drawdowns during this period, but my own stock trend following portfolio had very strong returns with little drawdown. There is obviously no guarantee that these results will continue in the future, nor am I suggesting that you will achieve the same returns. But when a stock is trending down, trend followers will not hold onto it - this is a distinct advantage over investing with a mutual fund manager who has to track their portfolio very close to the market index or compared to investing in an index fund which is a very passive strategy. When trend following stocks, you can cover far more stocks than a mutual fund - without the army of analysts. If I scan all the stocks in Australia, Hong Kong and the US for trends then I can identify far more trend opportunities that an Australian mutual fund could ever find. I can buy anything that fits my criteria but a fund can only buy what fits their mandate. Even if you just trade the fully paid ordinary stocks in Australia, that is over 1900 different stocks. If you include other international stock markets which can be traded through through your interactive brokers trading account then you have thousands of potential trading candidates…there will be a stock trend somewhere most of the time! Regardless of what the academics say, the markets are not efficient. I prefer to think about them as being semi efficient. This means that when new information comes to light, it often takes quite a bit of time for all market participants to become aware of the changed situation... And even more time for all participants to figure out the implications of the changed situation. Assuming the new fundamental change is positive, as some participants start to become aware they buy and the price moves up. As more participants become aware there is more buying and the price continues to move up until everyone who wants to buy is in the position. This progressive buying creates a fundamentally driven trend which can be quite long depending on how well analysed the stock is. If the markets were fully efficient this move would be a step change (like it often is in the case of a take over announcement - these generally cause a step change because the implication on company value is pretty obvious to all investors). The challenge in non-takeover situations is that no one really knows exactly what a company announcement is worth (despite what the analysts say, it is just an estimate). So this means prices trend as the market figures out what the new share price should be. Often the underlying driver of a trend is also trending too, so as the fundamental driver gets better, so too does the stock continue trending. This means that when your strategy is trend following stocks, you continue to benefit as the fundamentals move in your favour. The most obvious example is interest rates - once interest rates start moving in a particular direction, they tend to continue moving in that direction for quite some time. Stock fundamentals also trend. For example, Interest rate trends in the 13 week T Bill are very clear over the past 20 years. Interest rates don't go straight to the end point because the market gradually adjusts to a new equilibrium level (by which time something else will have changed anyway, so they just keep shifting). Because interest rates shift gradually the cost of debt to companies also shifts gradually, so their earnings shift gradually, so valuations shift gradually, so prices trend gradually. But there are always many fundamental shifts going on at any one time - when several of these line up in the same direction you get very big trends. This is why stocks can have mega trends and end up increasing in price by 10 times or more! This convergence of multiple trends in fundamental drivers is one of the most exciting things about trend following in stocks. Catching just one of these can mean high double digit returns for entire portfolio for the year. Even if all external fundamental conditions are constant (highly unlikely), company management can gradually improve the profitability of the business. This can be through efficiency improvement, new product development, pricing sophistication, better marketing, training and development, cost reduction and many other factors. Management typically makes these changes gradually, so profits improve gradually, so valuations improve gradually, so prices trend gradually. A great management team will be improving multiple parts of the business simultaneously, so these compound on each other creating strong trends in share price. But how do you determine which management teams are doing this? Well that is the great thing about trend following stocks - you don't have to. All you do is identify the stock that are trending up in price. If the management team is good and the underlying fundamental conditions are attractive then chances are you will be holding that company because the price will start going up. This is a really huge driver of why trend following stocks works so well...one huge reason we can beat the market is that investor confidence / excitement changes over time on two levels. The first is the overall market, the second is the individual stock. We all know that investor sentiment changes and moves in cycles. Sentiment can be measured by the price earnings multiple (PE = Share price / Earnings per share). When investors are confident of the future they are willing to pay more for each dollar of earnings, so the share price goes up and the PE multiple goes up. This is because humans are emotional creatures. When people are scared PE multiples contract, when people are confident and excited PE multiples expand. Thus even if fundamental conditions are stable (highly unlikely), stocks can trend because investor sentiment improves or deteriorates. This means that stocks can trend just because people collectively are getting more confident, even if there is no actual change. Shifts in market sentiment can cause PE multiples to go from single digits to very high double digits. This shift causes very big market or sector wide trends - like in the massive bull market leading up to 2000 when Price Earnings Multiples for the overall US Stockmarket went from single digits in the 1980's all the way up to over 40 before the tech bubble burst. Investor sentiment also applies to individual stocks. Say for example a company starts off with a boring story, no growth and no investor interest. It will have a low PE multiple. Then something fundamentally changes, new dynamic management gets put in place and good things start to happen. Investors get progressively more and more excited as things go right. Because things go right investors (who are typically not that bright and project things linearly) expect things to keep going right. Because they expect things to keep going right they are willing to pay higher and higher PE multiples. As the price goes up more people notice that something is happening and out of greed (to make money) and fear (of missing out on the trend), these new investors bid the stock up higher and higher to get in. Thus the PE multiple on the individual stock can move dramatically as investor sentiment about the stock keeps changing. This means that one stock can trend dramatically just because of changing investor excitement about the stocks story! Trend following stocks allows you to capture a large chunk of the huge price moves that happen when investor sentiment shifts like this. As you have seen, there are many reasons why trend following stocks has worked in the past, and plenty of evidence to suggest that this will continue to work in the future. If you have been dissatisfied with buy and hold or mutual fund investing, maybe it is time for you to learn how to profit using your own stock trend following system.